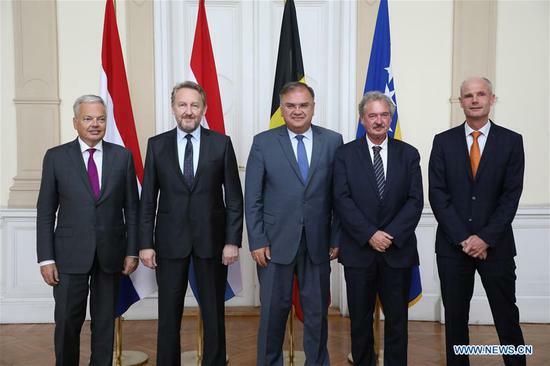 SARAJEVO, Sept. 13 (Xinhua) -- Visiting Benelux foreign ministers expressed their support for Bosnia and Herzegovina's (BiH) integration into the European Union (EU) at the meeting with Members of BiH Presidency here on Thursday. During the meeting, Belgian Deputy Prime Minister and Foreign Affairs Minister Didier Reynders, Luxembourg Minister for Foreign Affairs Jean Asselborn and Dutch Foreign Minister Stef Blok highlighted their support for the reforms BiH needs to undertake in order to enter the EU. The visiting foreign ministers expressed their contentment because they are visiting BiH in a dual capacity: as representatives of Benelux and EU member states. "The importance of continuation of the reform process, strengthening of the rule of law, and combating crime and corruption were noted as of tremendous importance when it comes to BiH path towards the EU," BiH Presidency press statement said. The visiting ministers highlighted the importance of adoption of the EU Strategy "A credible enlargement perspective for and enhanced EU engagement with the Western Balkans", as well as the Declaration of the Summit of the EU-Western Balkans held in Sofia, which confirm the European perspective of the countries of the region. For their part, Chairman of BiH Presidency Bakir Izetbegovic and Member of BiH Presidency Mladen Ivanic expressed their commitment to carry out the necessary activities and reforms to improve the lives of citizens and bring the country closer to the EU. They highlighted the process of preparing responses on the European Commission's questionnaire and its impact on improving the coordination of institutions in BiH.